Whose Knowledge? 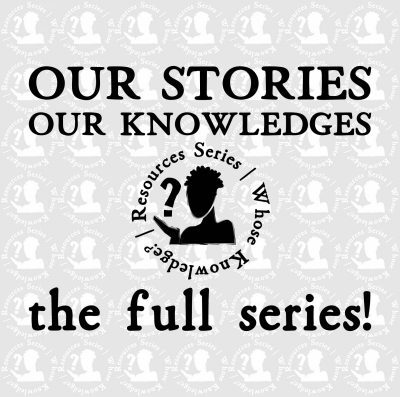 is pleased to present the full resource of the series “Our Stories Our Knowledges”, which brings together the four parts: “Decolonizing Our Stories and Knowledges”, “Transformative Practices for Building Community Knowledges”, “Adding Our Knowledge to Wikipedia” and “How to Ally and Be a Good Guest”. This resource series presents some important insights into the structures of power we’re dismantling and the struggles we face in centering our knowledges online. It then offers a set of practices and tools for marginalized communities working on knowledge production, reminding us to take care of ourselves and our communities as we do so. The third resource shares what we’ve done and learned in the quest of decolonizing knowledge on Wikipedia. Finally, the fourth part provides tips and suggestions tailored for allies who want to support marginalized communities in preserving and sharing their knowledge. “Our Stories Our Knowledges” is co-authored by members of Native American communities of the Kumeyaay and Shoshone, Dalit feminist communities from India and the diaspora, LGBTIQA communities from Bosnia Herzegovina, the Whose Knowledge? team and its allies. The authors seek to support you in challenging and overcoming the many obstacles hindering the production, preservation and sharing of your communities’ knowledge, and guide you in building collaborative alliances and more powerful networks of solidarity.